Our product range includes a wide range of asbestos webbing tape for coil winding, industrial fiberglass tapes, unvarnished fiberglass tapes, graphite coated fiberglass woven tape and fiberglass tape. 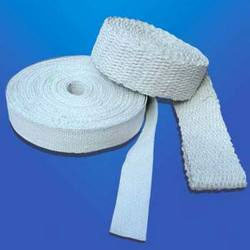 We offer a wide range of Asbestos Webbing Tape which are specially designed to meet the exacting requirements of the clients. Asbestos Webbing tape are handy and so can conveniently be carried anywhere at anytime and used right on the spot of work. 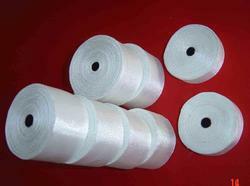 Fiberglass tape is usually a narrow, cloth strip with woven edges that prevent unraveling. 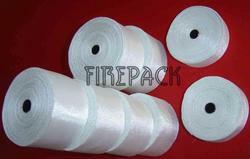 We are a prominent Unvarnished Fiberglass Tapes manufacturer and supplier based in India. 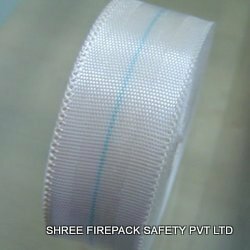 Shree firepack safety pvt ltdspecializes in offering qualitative range of Unvarnished Fiberglass Tapes.Also our range of product include like yarn, ropes,cloth,webbing tapes,fire blanket,aprons,suits,welding blanket,coated & uncoated fabrics made of asbestos,non asbestos material like glass fiber,cermaic fiber & silica. Owing to the expertise of our professionals, we have been engaged in offering Graphite Coated Fiberglass Woven Tape. Graphite coated tape improve the abrasion resistance and higher temperature performance. Suitable for use in hot, dry conditions and aggressive environments where flexing may damage untreated fabrics. Woven with the Fiberglass, had good insulation and heat resistance, extensively apply to building, waterproof ,antiseptic and warping up the coil of electrical machinery and electrical apparatus. fiberglass tape is an excellent substitute for asbestos tape. Fiberglass Tape abbreviated as non-alkali tape is woven of non-alkali fiberglass, With its feature of thermal resistance and insulation. Drywall fiberglass tape can be used as the bindings of boiler for electrical machinery and appliances. The drywall fiber glass tape product offers high resistance to temperature , insulation rebate, erosion resistance, heat preservation, environmentally friendly, sound insulation, good filtration vista performance and so on. Application: It is recommended for wrapping tracer steam lines, the hose piping, exhaust manifold insulation wrap, tadpole tapes,head gasket, and strip curtains for high temperature ovens.